These tires when used properly in sets of 4 will give you a Superior amount of traction in adverse conditions such as snow and ice. If you normally use All-Season tires you won’t believe how much better a set of Quality Winter Tires will increase and improve your traction! I currently have 4 In Stock total and I will only sell them as a set of 4. 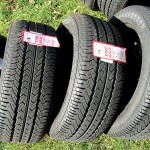 Tires are priced PER Tire. Shop Small Business and $AVE over the other guys! Please read my F.A.Q. (Frequently asked Questions page) if you have any questions. Please call me to order as I do not have the website setup for online ordering, I’d rather actually talk to my customers.